« Day 451 In Beijing: The Blue Mosque, Part 1. Day 452 In Beijing: The Blue Mosque, Part 2. 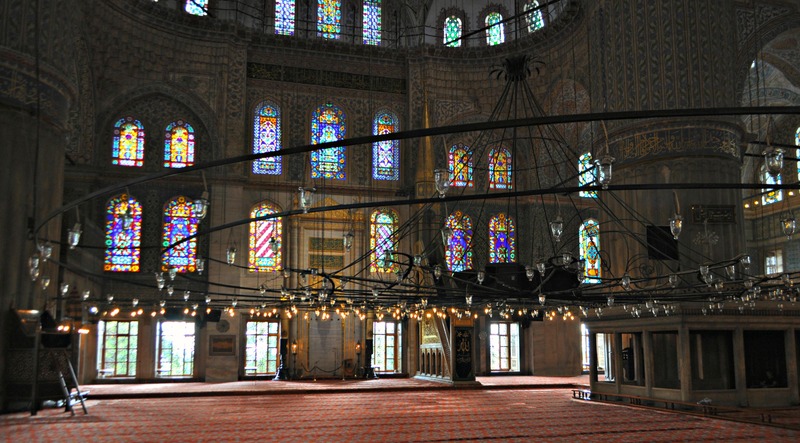 The prayer area of the Blue Mosque. Even though Jill doesn’t like having to cover, we both loved the Blue Mosque. 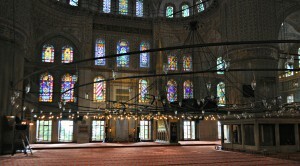 For your information, mosque are called “Camii” in Turkish. This would seem to be easily pronounced as “Cami” like a girl’s name, but it isn’t. The letter “C” is actually pronounced as a “J” in Turkish. This isn’t that hard once you figure it out. The weird part is the pronnouncation of Jill’s name. People in Turkey are totally confused by it. Since “C” is pronounced as a “J” there is no letter “J” in Turkish. Therefore, everywhere we were booked in a hotel or for our tours, people were quite confused and couldn’t pronounce it on the first try. I actually enjoyed this because “Aram” is an Armenian name, and a name also used in some Arabic countries, so people almost always pronounced my name with ease. It was a very nice culture shock that I had forgotten from my last time in Turkey, about 10 years ago, and enjoyed greatly. There is a city in Turkey, called Çanakkale and our tour guide says they are constantly confused because tourists ask to go to “Canakkale” and not “CHanakkale” and they don’t understand where they want to go until they realize the tourist doesn’t understand that the word should be pronounced with the “Ch” sound.